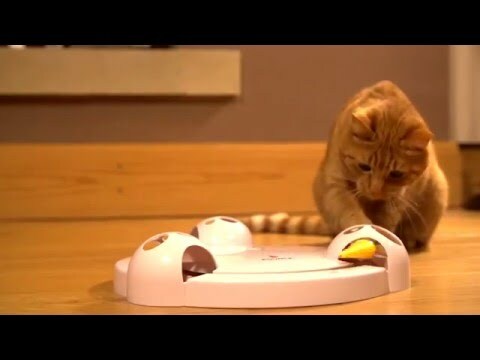 DART DUO™ toy is an automatic rotating light with 2 lasers for shared play with multiple cats. Place the toy on the floor, turn it on, and watch them play! 2 lasers move in a circle, darting and switching directions in random patterns. The unpredictable movement entices your pets to dart, pounce, and chase the red dot. Each laser spins in a circle on opposite sides so pets aren't competing for the same laser. 4 adjustable speed and 4 timer settings create 16 engaging play combinations. Key Features: 2 lasers for double the fun. Random circular laser patterns. Variable speed settings: slow, medium, fast or variable. Adjustable timer: 5, 10, 15 or 20 minute playtime. Features: For cats of any size. Uses 3 x AA batteries (not included).